GREAT VALUE AND AMMENITIES. Very nice yet economical, efficiency (no bedroom) condominium with adjacent kitchen right on the ski hill at Caribou Highlands Lodge. In Winter: numerous chair lifts and gondola to wonderful challenging and beginner ski runs. In Summer: hike the Superior Hiking Trail, fish dozens of lakes and streams, golf Superior National Course, swim in beautiful outdoor and indoor pools, tennis courts, bike trails. Spectacular North Shore of Lake Superior hiking, cross-country skiing, fabulous mountain biking, fishing, and countless other activities listed. Condominium is small, not fancy, but very modern and nice. Sleeps four with Murphy bed and sofa bed. Complete modern kitchen with new appliances, new stereo, TV, etc. Other amenities include both outdoor (Summer) and indoor heated pools, large Jacuzzi tub, and work-out room. Kids love the Mountain Kids Camp on the premises including educational nature hikes and indoor craft activities. Great restaurants and shopping on the premises and at Grand Marais only 20 miles north where the famous Gunflint Trail takes you to the northern reaches of Minnesota and access to the Boundary Water Canoe Area. Inexpensive, basic but very nice and clean. Overlooks outdoor pool and playground. My family and I enjoyed our cozy stay right off the ski mtn. This rental place was clean and perfect for an active family. We didn’t spend a lot of time inside so the small quarters were perfect for us. We would definitely stay here again. It is older and a little run down but cost reflects; comfortable and clean. Kids loved the pool and used nightly. Take out at Moguls was nice since I injured my knee skiing and was unable to walk. The ability to ski in and out was fantastic. For two adults with young kids it worked well. Very neat and clean. Great location! Really enjoyed our stay, the amenities were excellent. 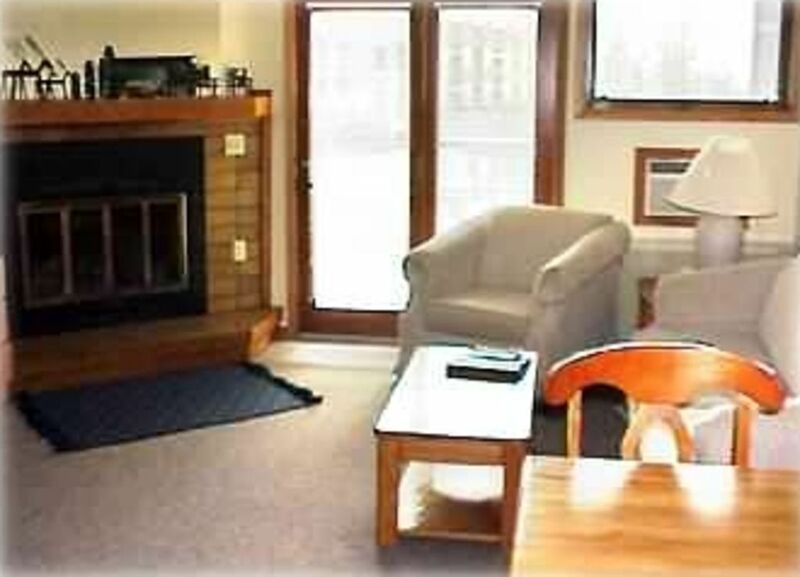 We thought this condo was in a great location--easy, close access to the ski trails. The unit had everything we needed including a well-appointed kitchen. This unit is fairly small, but for the two in my party, it was absolutely perfect. It had a very comfortable double Murphy bed that we could tuck away into the wall during the day. The sofa also pulled out into a double bed, however, we did not use that. The beautiful, new-looking deck was large and gave us a great view towards Lake Superior. The condo unit had a nice big screen TV with lots of channels (I think there was a DVD player, too, but we didn't use it) and had a lovely wood burning fireplace supplied with matches, newspaper, kindling, and wood. (Note: The wood provided by the resort was pretty wet as it was under snow cover and didn't burn well--it took a lot of babysitting to keep it going. I suggest bringing some of your own fire starters and purchasing some dry wood bundles at a local grocery store to supplement the wood provided.) The pool and hot tub area was great and relaxing after a long day skiing. The rate was decent compared with others in this location. Also, the owner was very responsive to any questions I had; I'd love to stay here again the next time I ski at Lutsen! My fiancé and I stayed here in January. The views from the deck are beautiful. Ski in ski out was a huge perk as well. The unit was cozy and perfect for our stay. Would definitely stay again. Thanks for sharing your home, Dennis!